Home / Articles / Will I Have To Pay Alimony? If you have been the primary financial provider for your family, it is possible that you will have to make alimony payments. In many states, there is no hard and fast method of calculating alimony payments. And to be quite frank, estimating what a judge may do is often fruitless. Because the laws of many states allow so much judicial discretion in calculating alimony, the methods and manners for determining whether alimony is appropriate and/or how much alimony should be paid may vary from court to court. Husband and Wife met in college. Both graduated from college with bachelor’s degrees in accounting. They married after graduation when Husband was 23 and Wife was 22 years old. Both parties began working in accounting immediately after graduation. Wife stopped working at the birth of the parties’ first child and has been a stay at home mom since. Husband is now 35 years old and earns approximately $106,000. Wife is 34 and stays at home with their two young children. Question: Will Husband have to pay alimony? How much? For how long will have to pay? Answer: Yes, Husband will likely have to pay alimony and the answers to the remaining questions may vary depending on a number of factors. Financial resources of each party: The court will consider whether Wife has financial resources other than Husband’s income with which to support herself. For example, if Husband did provide the financial support for the family, but Wife had a $2 million savings account that had not been touched during the course of the marriage, the court may not choose to award alimony to Wife because she has resources off of which she may support herself until she acclimates herself into the workforce. Time needed to acquire training or education to re-enter the workforce: The court definitely contemplates how long it will take Wife to get herself into the work force. In the scenario mentioned, Wife earned a bachelor’s degree and gained some work experience. However, it has been many since she was last employed. In today’s economy, it is extremely difficult to find work, even when your most recent experience was just a few months ago. The courts do recognize the difficulty in obtaining work and will contemplate this in alimony awards. A high unemployment rate makes it undeniable that getting work is difficult. Plus, the high unemployment rate does not include people like Wife, who are voluntarily not working. This number is the percentage of people who are looking for work and cannot find it. The court will likely allow somewhere between three and seven years of alimony payments in the scenario above. Each spouse’s earning capacity: In the scenario above, Wife has the ability earn at the rate of a professional. She has a bachelor’s degree and some work experience. She, however, certainly does not have the earning capacity of Husband given that Husband is currently in the work force and has been for many years. Some judges will equalize the parties’ income (before the consideration of child support) and then allow for a drop down of the support after time periods allowing for Wife to re-establish herself into the workforce. Contributions to the marriage: The courts definitely consider a stay at home spouse’s work toward supporting the house. A court can order temporary alimony while the divorce is pending. Most alimony is ordered for a specific length of time. Though conduct can bar permanent alimony, it is possible for the court to enter an award for temporary alimony, even when conduct may otherwise not order it on a permanent basis. So if you have been the primary provider for your spouse and children and your spouse is not able to support herself, you probably will have to pay some form of spousal support. If you have any questions or concerns about whether you are going to be required to pay alimony, it is a good idea to get in touch with a men’s divorce lawyer who understands the laws in your state. Andrea M. Johnson is a Senior Attorney in the Atlanta, Georgia office of Cordell & Cordell, where she practices domestic relations exclusively. Ms. Johnson is licensed to practice law in the state of Georgia. Ms. Johnson was born in the metro-Atlanta area and has spent most of her life in Georgia. She received her Bachelor of Science in Political Science from Columbus State University in Columbus, Georgia in 1998. Ms. Johnson received her Juris Doctor from Mercer University School of Law in 2002. Since graduating from law school, Ms. Johnson has practiced in the area of family law. Additionally, she has worked in general civil practice, immigration, and estate planning. Ms. Johnson has briefed two cases successfully before the Georgia Court of Appeals, one of which was a modification of custody action. ← Money Made Easy: Choose a Fixed or Adjustable Rate Mortgage? I don’t understand and maybe someone can help me. We both agreed that she would be a stay at home mom until the kids were grown. They are now. She had a great job last year and went back to work for a PVT school where they only worked 3 days a week. She decided that she did not have enough time to what she wanted. so this year she is only working one day a week. I was in the Army and got my degree and a great career. I got my degree while deployed in a warzone. She has stated that she gave everything up for me and the kids. But she could have went to school at anytime she wanted. Why (since she is unhappy and did not pursue a career or higher education) am I going to have to pay for the rest of her life? She stated if we divorce she will not remarry nor would I. She did not want my saving for retirement and has cleaned out our IRA as she does not trust the stock market. Our kids go to a PVT school which I will gladly keep them in. But again why is everything geared towards the woman? I have provided her a care free life with financial security and she want for nothing. So if she wants a divorce WHY am I the one to be penalized and from what I have been reading, I may end up paying her way (when she is totally capable of working but chooses not to) probably for the rest of her life? I don’t want a divorce and am happy, she is the one who is unhappy. I drive a rusty old pickup and make sure she stays in style. Is this what I get for making sure she has had everything she wants? And just because SHE is unhappy about HER life why should I have to pay for that? I’m lost and don’t know what to do. I’ve been married for 5 years. After 3 years of marriage, I found out that husband had been married previously for 5 years and did not tell me. Even afterI found out, he said that I had wrong information and that it was not true. Finally, I contacted the ex wife who verified the truth to me. Since then, husband changed all passwords to all account and I have no access to funds. He has been taking money from his company 401K and putting into a separate account and has been withdrawing large sums of $$ from the bank (more than 10K at times). He has removed me as beneficiary of his life insurance. . and goes on extravagant vacations with his grown daughter and I’m not allowed to go. If I say I want to go on a nice vacation .. he says, “what you do with your money is your own business.”. he makes 200K. I was making around $14K. but I have filed for disability for severe back problems and fibromalygia. I’m still waiting for a hearing and that might take up to 2 years. . . My husband continually lies to me and I feel miserable and isolated. I want out of the marriage, but I have no money except for about $100K in a retirmement account that I had prior to our marriage. I feel trapped. Do you think I can be awarded alimony? Please help! Of course a woman who has never worked deserves alimony. It is how the court systems help keep additional deadbeats off of welfare. They start being a SAHM.. then become housewife, then retired housewife.. then eventually just live off the alimony provided by some hard working sucker. But I guess you hated all the things she did at home for kids and for you having dinner prepared for you cleaning, cooking, finances, taxes, shopping, worrying about a car repair while your sleeping, working all hours of the day, when you were not expected to do anything once you got home. You are the deadbeat husband, that didn’t mind what he had and preferred her to be home at your beckon call. Alimony is the early termination fee for lifetime contract get used to it. So what if he actually took care of the kids, finances, car repairs, taxes, cooking, and cleaning when he got off work? Some women truly do not do anything does that still make him a deadbeat husband??? SMH not sure how you can sit here and judge someone you dont know! You’re assuming she actually did all those things. There’s just as much chance she was pathetic. It happens all the time sister, let me tell you. Alimony needs to be abolished period! It’s bias to men they make more usually etc. however ladies need to toughen up if your a guys equal you can take care of yourself get a job move up. The us is stupid in its child support and alimony rules. A lady can make just as much as any guy if she applies herself. This is normal workers not the top 2% I’m talking about. Besides any lady can get a sugar daddy anyways , guys don’t have that luxury to find a woman to pay all bills plus an allowance for a night of fun a couple times a week. In general I’m sure there are some sugar mommas but it’s slim for just any guy to find that. This is why I will till my son to never marry. My wife prepared dinner 1 out of 4 days per week. She brought in takeout the rest of the time at a very high cost. She never paid a single bill or did any finances for the family. None. She never went to the car repair center, I used my leave from work. She does not lake to get up early and she does not feel well. She is not disable and has only works 4 years our of thirty. We had children during the last 18 of those years. I work two jobs to maintain our home and keep our children well fed and in a nice neighborhood. I went to college full time at night while my wife stayed at home. My wife has never attempted to improve her education and dropped out of a typing class 25 years ago. My children did not want me to divorce her and feel sorry for her, but now that they are older, they want me to divorce her to force her to leave our home. I am a decorated veteran and honorably discharged. This is why I will tell my son to only marry with a prenup. If he is ever successful, they system is rigged against him. I’m getting divorced after 10 years of marriage and five years of separation. My wife never worked those 10 years and stayed home to raise our daughter and her kids who are all now adults and still live at home. She says she’s unable to work due to medications she takes for medical issues. However refuses to try to get on disability. I’ve had to work 60 to 100 hours of overtime a month just to cover all of her expensises and even lived in my car for a year so my daughter could have what she needed. Now I’m being told I should have cut her off even if the kids and her ended up homeless. This is bc she is now asking for 110% of my check in spousal support! And my attorney said she may get it bc she’s used to getting it. Oregon has no scale for alimony like they do for child support. So by taking care of my child I’ve actually hurt myself and will be punished for being a good provider vs no punishment if I’d just given her 50% of my check and never worked overtime and told her to figure it out. Then the most she would have ever got is 50%. Now I’m looking at being homeless again while trying to work enough ot to cover court mandated spousal support and live off of non guaranteed overtime and try no to freeze to death this winter plus put 60 extra miles on my vehicle a day just to go to a rest stop to sleep since lodging laws in town prohibit you from sleeping in your vehicle. Terminal cancer right now would be cheaper than this divorce and probably more pleasant. I have been married for 8 years and together for 10 years . I was in the military for 7 of the 10 years and my wife has nevered worked and has no high school diploma. Even though she has had many opportunities to get it while I was in the miltary. Would I have to pay alimony. What would be the chances of getting custody of my 3 children. I’m in school getting a associates in avation maintance. Any help would be greatly appreciated. My wife of 23 yrs is an RN and makes more money than I do, she has her masters in nursing and is holding off on taking her nurse practitioners exam which would eventually double her salary in the long run, because she would rather sue me for alimony first. Can she do this? Will the court make me pay her alimony? Then allow her to benefit from receiving the alimony and then doubling her salary after the fact? I make $34k and she makes $65k and after she becomes a nurse practitioner, her salary will go up to over $100k. I have a friend he is married for 25 years but his wife never work … There have 2 kids there in the twenties …… There not not together for 5 years ….. does he still have to pay her rent??? I am grateful for the clarifications on alimony in this article. It makes so much sense to me that a woman who is a stay at home mom would need to have some child support. I didn’t know however that alimony is awarded based on marriage length in some states! Hi, I live in georgia and I’ve been divorced for about 8 months now. I pay 2 child supports and alimony. The divorce is finalized. I recently found out by facebook that my ex-wife was already in a relationship with somene else before the divorce was done and I was still living in the same house. Can I still take her to court to take of the alimony since I found out she was cheating on me. Someone I know has been married for 8 years seperated into different states with absolutely no contact for 4 of those 8 years the wife has since been with many men and left the husband with all the tax debt she alone ran up on credit cards in his name. I have been married 20 yrs and my husband stopped all making love to me 13 yrs ago. We are both 62 yrs old and in great health. He has been cheating on me for years and I can’t divorce hI’m because I can’t afford to take care of myself by myself. .we both work but he makes 3 times what Iake. Can I get alimony? I was in a marriage for 5 years . Together for 7 years. Before marrying she cheated on me. I married in hopes of making are relationship better. It only became worse. We are now divorcing and because of my health I’m unable to support myself or daughter from a previous relationship, because of health issues. My wife makes $130,000 a year. From what I have read, a 5 year marriage may not be long enough even for alimony support. Just to allow me to get back on my feet. I would appreciate feed back anyone with experience with this. If somebody could please inform me that would be great, thank you. What if the wife lies to the husband, and even to thE child for him to, ” not tell daddy she’s with her friend. ” The wife is clearly seeing someone else. The husband is a hardworker who loves his kids and wants to keep the family together, but the wife is seeing someone else. Out of nowhere while the husband is at work she moves all her stuff and leaves the house of matrimony to live with her mom. The husband is sad, but somehow they both take turns taking.care of the kids. There r 2 childs. The mother is more concerned and worried about going out with her friends. I am the brother of the husband and she had dropped of the both the kids one weekend cause she was ” going.out for the week” knowing the youngest child whom is 2 was really sick, me and my brother had to go to the doctors and grab him medicine. The kids like being.with their father more. They even say it. She was the one that left when he wanted to keep the family together. And now she wants him to pay child support and alimony. But she has her own job, could she actually win? Is the woman more favored? She was the one who left, lied, cheated, left the kids with my brother when they were super sick and now she wants alimony and custody?? Keep in mind, knowing her since I was little, before they were married she was a mean lady, I don’t want to use the other word, but yeah she is. The courts usually do a pretty good job in determining what alimony is owed. I would say that it does go both ways. My husband and I divorced a few years a go and my position with my business makes more money than he does so I was actually required to pay him alimony. A twist that isn’t typical but I know what he makes and we have joint custody so in my opinion the money is going to help support my kids when they are with him, and for that I have no problem paying. Mike- we live in Arkansas. And what happened was she cried that she wanted to go overseas to see her family, so I gave her $3200, she came back complaining about her citizenhip needed to get paid for $900, I told her I didn’t have the money till after the new year, she got mad and just left without me knowing, until someone from church told me they helped her move out. I wonder what lies she told them about me, oh well. the kids didn’t like her anyway and I was tired of her telling me how my kids are stupid idiots…Even though there “A” students in school..hmmm. really, “idiots” whatever, me and them know dif’t. anyway, used? I feel it!! my 1st wife left after 10 years, and then abandoned us, filed for divorce and said “I don’t want the kids! ” and left. shock? Id say. there is a video of this, my lawyer was shocked so was the judge. I have 2 kids, 11 and 14 from a prev marriage where the 1st wife has moved overseas and we never hear from her. My 2nd wife now has moved out after 3 years and wants to sue me for Alimony. She works under the table cleaning homes. She wanted me to sign for her citizenship and I didn’t have the money and so she got mad and moved out. So I know where her heart really was, but do I still pay alimony even though im supporting my 2 kids and working 2 jobs? I have been a stay at home father for 4 years and also have a health problem. Can I get alimony ? I live in Tennessee plus my wife makes 85k a year and i make 0 income. Will I have to pay child support? We have similar situations. Except for my wife makes almost twice as much. And I have a 11 y.o daughter from a previous relationship. Her mother left before she was 1 y.o. So I have cared for her and raised her on my own. This would not be a problem to continue taking care of her. Aside from my deteriorating health. I would greatly appreciate it. If would let me know what type of responses you receive from your post. My husband and I have been married for 3 years now, been together a total of nearly 7 years. We have a 2 & 1/2 year old daughter. I’m a stay at home mom and home maker. My husband works out of state 3 months at a time and only home for a week or two then back out of town. He makes roughly $5,000 a month. He says he just doesn’t want to be married anymore, I’m assuming he wants to just be free to do whatever he wants to do. I’m trying very hard to make our marriage work, but I’m not sure it will work out if he has his mind set. My question is how much in child support will he owe me per month? Also we do t own a home we rent, and I really don’t have anywhere to go, no job, it will take me some time to find work and when I do I’ll have to do childcare. Will he have to pay me alimony and about how much? i have been married for 17 years and im trying to go through a divorce. my husband is a RN and i’m a stay at home mom and have had off and on jobs for the whole time we were married. i stayed at home with the kids til my youngest went to school full time as in going from half a day pre k to a full day Kindergarden. Will my husband have to pay me alimony? and if so, for how long? My wife worked for 20 years with the government and was terminated due to unprofessional conduct. She has become a drug addict and alcoholic and would stop going to work and finally even the government had enough and fired her. I earned about 15-20K more than she did the last 5 years and now she earns nothing and was denied unemployment because of all the reasons she was fired. She has been in and out of rehab and now I am divorcing her. I am paying the house payment and all the bills now by myself and she does nothing to contribute and has not moved out but has not lived here for 2 months. We have a 14yo daughter together that I pay for all cost of school, sports, etc. Will I have to pay Alimony? I am trying to get full custody and asking for Child Support during the course of the divorce. Everything is well documented and I have all the paperwork about her job. I been married for 5 years during this time my wife have moved out several times we are getting divorce I don’t have a lawyer she does she worked all while we was married and she just quit her job a few weeks ago and now her lawyer is asking for the last pass 5 years of all my income bank pension etc. will I have to pay her alimony. I’m getting divorced after 16 years of marriage. My wife moved out and left my step daughter with me while at the same time telling her lawyer I am abusive to her daughter. I earn over 100K and she has worked the entire marriage but most of her money is non taxable so it appears on paper that she earns considerably less than what she actually earns. She also recently completed her degree and is a licensed nurse but doesn’t currently work as a nurse. She continually threatens alimony because that’s what her lawyer is telling her. Will I have to pay alimony? my husband has repeatedly told me if i divorce him, then he will get alimony because i make more money the he does. However he does work 40 hrs a wk, makes $17.00 an hr and only shows on his taxes 11,000-13,000 a yr. However, i have a salaried job and makes $29,000 a year. We have no bills but the usual. We don’t have children together our children are grown and we have been married only 8 yrs. He does on a house that was put in his name only 3 yrs ago paid for.Which the taxes and insurance are paid out of family income. Which he states his attorney (criminal attorney)has told him that I would have to pay him alimony and I am not entitled to anything of his. Is this true? Im from NC. Me and my wife have been married for 38 years. Kids are grown and out of the house. She still works, but I am retired. I still bring home more money than her. She is getting the farm that we live on because she inherited it from her family. Will I be required to pay alimony? My spouse has a bachelors as a paralegal and I have an associates. She has already received the education needed to obtain an excellent job, however she currently works as a county court clerk making less than $2000 a month. I on the other hand have an associates degree and work as a service writer making approximately double her salary. In this scenario to what length should I be expected to pay alimony when she has already received the degree just not actively sought employment in her field? Her current request which, includes child support brings my income down to $2300 per month while raising her income to $4075. Is this fair and equitable given the circumstances? The child support has been calculated to be $884 which I am certainly wiling to pay. I want to know what additional moneys I should expect to pay in alimony and still be able to support myself and future family. I have been married for 9 years and 4 months and im getting a divorce. I have no kids, we don’t have a mortgage, I make $45,000 and my wife makes $30,000. How much would I owe her for alimony and how long would I have to pay? My wife and I have been married for 2 years. She is not a permanent resident in the US. I have been the sole provider for the entire marriage. Although not this is not the reason for the divorce, she has willfully refused to find employment, even after being legally approved and issued a work permit. Citing irreconcilable differences, we opted for divorce. What are my chances of having to pay alimony? I have been married for 11 years. My husband went to prison for 2 of those years. When he got out, he could not find a job. Our daughter age 12 had a heart attack and was hospitalized and has a defribrillator implanted in her chest. I have to pay for medication, and office visit co pays until she needs her heart transplant. I have a 3 year old child also with him. I pay child care. I pay for everything including rent, food, clothes for the kids, utilities, insurance payments etc. Last year I cleared a little over $39,000. My husband is a truck driver and was making good money when we got married. He has not worked in 7 years except for last year where he supposedly made $8000.00 that I did not know about. 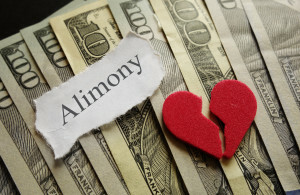 If we divorce, will I have to pay alimony? Income from a new spouse is not considered because a new spouse does not have a legal duty to support the child, but it may be considered indirectly, according to Cordell & Cordell attorney Jennifer Paine. For example, a new spouse may assume payments for the ex’s debts, thereby freeing the ex’s previously devoted resources for child support. If I got remarried would my ex be able to increase my alimony based on what my husband contributes to our household combined income?